Tucker! In the potty!! Last night he snuck away into the bathroom completely by himself. I heard him playing with Emmie’s little singing potty, but I figured he was just playing with it(like he often does). Then he yells, “I pooped!”. I ran in there, expecting to have to clean yet another pair of dirty underwear…but nope. There he was grinning proudly on Em’s potty. He did it! He got his Lightening McQueen remote control car he picked out. He got ice cream. You’d have thought he’d won the world series or something by the way we were all cheering! It’s ridiculous, I know, but I even teared up! This has been a long time in the works, my dear friends. It’s no longer just a big deal-it’s a major event! 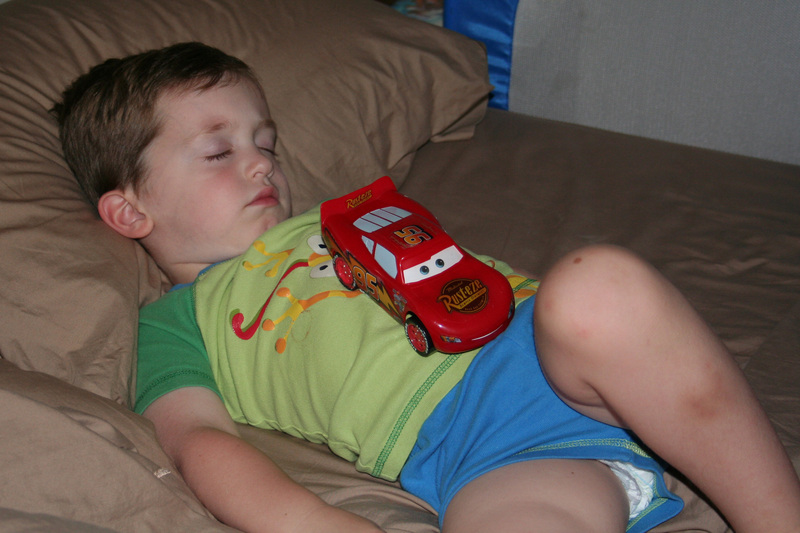 So for those of you who don’t have kids, and/or just don’t understand why all parental conversations tend to come back around to poop, I do have a non-poop related picture of him sleeping with his new Lightening McQueen car. I’ve never seen him so excited about a toy. And I have a video clip of him playing with it on my new Flip Video (which I love!). I’ll add it, too, if I can figure out how to move it from my computer(which is not connected to the internet) to my dad’s computer(which is!). I think I’ve got it, although there seems to be a problem with the volume. I had to turn mine all the way up to hear it. Sorry! No Responses to Who do the poo? I get it completely. Congrats on the big achievement!